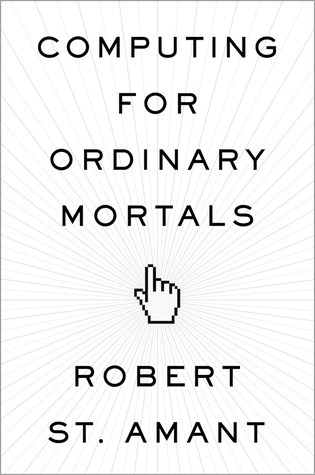 In Computing for Ordinary Mortals, cognitive scientist and AI expert Robert St. Amant explains what he calls, "the really interesting part" of computing, which are the ideas behind the technology. They're powerful ideas, and the foundations for everything that computers do, but they are little discussed. This book will not tell you how to use your computer, but it will give you a conceptual tour of how it works. Some of the ideas, like modularity which are so embedded in what we do as humans, can also give us insight into our own daily activities, how we interact with other people, and in some cases even what's going on in our heads. Computing is all around us, and, to quote Richard Hamming, the influential mathematician and computer scientist, "The purpose of computing is insight, not numbers," and it is this insight that informs the entire book. St. Amant starts off with an overview of basic concepts in computing-computers are machines, though different in a few important ways from other kinds of machines. From this point we'll follow two different threads through the fabric of computing. One thread is practical. He explains how the architecture of a computer (it's a more dynamic architecture than that of a building) makes it possible for computers to be efficient. He then shows us how to write down instructions so that a computer can accomplish specific tasks (programming), how the computer manages those tasks as it runs (in its operating system), and how computers can communicate with each other (over a network). The other thread is theoretical. Computers are physical machines, but they process information-in the abstract, they're machines for solving problems. Here we get a view into the nature of computing itself, to see what can be computed and how easily it can be done. This was a mixed bag for me, partly because I didn't feel it entirely accomplished what it 'said on the label'. This claims to be a book for everyday people, such as bloggers who wish to know more about how their computer works. And to some extent it succeeds. There were certain chapters on how the computer works I found interesting, and I also enjoyed the chapter on AI. But, there were some chapters I found a little dry and I believe they require a certain pre-requisite knowledge that I don't possess. I would say this is more a book for an amateur with some initial knowledge as opposed to a lay person who uses computers regularly but does not have a strong background in the language and systems that make it work. In conclusion: good for the right audience, but maybe not for everybody unless they are really keen on a lot of dry detail.